Casa Deli, founded by Rafael Ladrón de Guevara, imports Spanish-style confectionery products to Finland. Products are sold in grocery stores and cafes. They are carefully selected and suitable for Finnish flavors. K-Market Jätkäsaari in Helsinki is one seller of the Casa Deli products. Merchant Ville Hämäläinen says that he is happy to sell new products as he wants to offer a variety of products to his customers. ” 3-4 years ago Rafael walked in and offered products for sale. They have been in our range since then”, the merchant remembers. “First we experimented with really many products, and at the beginning we had a bit too much of products. However, it became very clear what products should be kept in the range”, he continues. From the very beginning, the favourite product of our customers has been Casa Deli´s famous Ham & Cheese Napolitana. In particular, the construction workers of the new Jätkäsaari residential area have taken over the product, and it has become their overwhelming favourite snack. “It is a good-sized pastry, with the ham and cheese inside. It has been a success product all the time because it is a good price and nutritious enough. There are many things right in the product, similar other products are not on the market, “ says Ville Hämäläinen, thinking the reasons for success. K-Market Jätkäsaari standard menu includes Ham & Cheese Napolitana as well as three different kinds of bread: soy bread, rye & oat bread and catalan bread. In addition, we are testing other products randomly. For example, on a Valentine’s Day, you could pick up take away heart-shaped sweet pastries from baking points. However, the bestsellers are the favorite basic products. “People love Casa Deli products, as they are clearly a bit different. We have deliberately picked our selection of products from Casa Deli that are clearly different from those of other producers”, says the merchant. According to Hämäläinen, the right products can be found only by experimenting, and the demand for product can’t be predicted in advance. According to merchant, co-operation with Casa Deli has gone smoothly. “Rafael is a good guy, and that’s all when you co-operate with someone. 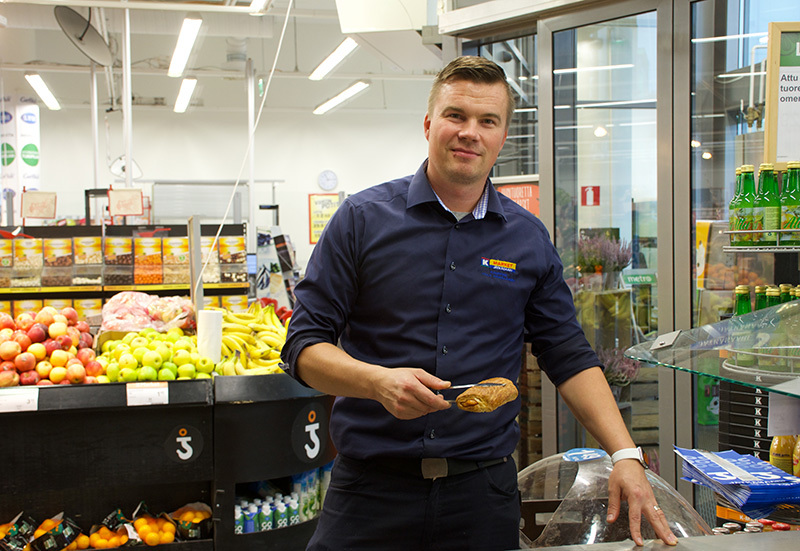 Rafael knew how to sell the products to us, and it has been easy working with him”, says Hämäläinen. “Co-operation with Casa Deli has been reliable: the goods come on time and it works as it should”, he says.